Holiday decorations in the lobby of an office building, catering to all tastes. A Jewish Hanukkah menorah beside Christmas flowers. Today, this minor festival of Hanukkah has become supersized into a Jewish version of Christmas – a time for family gatherings, gift-giving and festivity. But it is through pop culture that Jews have found their own identity, in which they can take pride. (THE CONVERSATION) When I was growing up in suburban New York, Hanukkah was not grounded in religious observance. Having no clue that there are traditional Hebrew blessings that accompany the kindling of the Hanukkah candles, we invented our own wishes, awkwardly voiced out loud, for happiness and peace. Then again, the festival of Hanukkah demands the performance of fewer religious rituals than most other Jewish observances. Even the most pious Jews do not take off from work during the eight-day festival. After all, the holiday is never mentioned in the Bible, since the events that it commemorates occurred hundreds of years after the Bible was written. 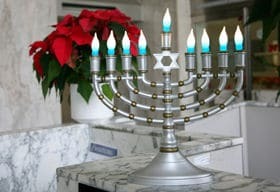 The true story of Hanukkah is of a conflict between two different groups of Jews – those who were eager to become part of the Hellenistic culture represented by the Syrian-Greeks against a band of zealots called the Maccabees, who sought to maintain Jewish rites. Today, in the U.S., however, only 15 percent of American Jews view their Jewish identity as rooted in religion. And for many American Jews, aspects of Hanukkah that are most attractive tend to be those that mirror what many other Americans are doing at this time of year – such as celebrating Christmas. As some economists have pointed out, Hanukkah is the only Jewish holiday that is celebrated much more widely among American Jews who have children. Notably, Jews who live in Christian majority areas, end up spending more on Hanukkah gifts than those who reside in mostly Jewish neighborhoods. By contrast, Hanukkah in Israel is not as significant. Nonetheless, American Jews have carved out a place for Hanukkah in pop culture. Seeing their own group depicted in pop culture has been an important source of pride for American Jews throughout the last century, as I observed in my book on Jewish vaudeville, theater and film. Jewish comedians over the last few decades have mined humor from the need that Jews have to feel that their minority identity is still a meaningful and salient one, even while poking gentle fun at Christmas. An example is that of comedian Jon Lovitz’s Hanukkah Harry premiered on “Saturday Night Live” in 1989. As a gray-bearded, ultra-Orthodox Jewish character, Hanukkah Harry fills in for an ailing Santa to deliver presents on Christmas Eve only to face disappointment from Christian children when they receive chocolate coins and dreidels, a Hanukkah spinning top, which seem paltry and foreign to them. And another comedian, Adam Sandler, whose “Hanukkah Song” was first performed on “Saturday Night Live” in 1994, reminds Jews that they have their own holiday in which they can take pride. “When you feel like the only kid in town without a Christmas tree,” the song starts off, “here’s a list of people who are Jewish just like you and me,” and then provides a humorous list of celebrities who are at least partly Jewish in ancestry, from Kirk Douglas to Dinah Shore. The song has been watched almost 5 million times on YouTube. Some scholars suggest that before making Hanukkah into an essentially non-religious celebration, Jews had already “secularized” Christmas. Music scholar David Lehman, for example, writes that Christmas “became a secular holiday” thanks to the efforts of composer Irving Berlin, a Russian Jewish immigrant whose “White Christmas” unified Americans during the Second World War. Its lyrics about “sleigh bells in the snow” appealed to common feelings of nostalgia toward hearth and home. Indeed, a new documentary from Canadian filmmaker Larry Weinstein also shows the role of Jewish songwriters in recreating Christmas as a secular holiday. The majority of iconic Christmas carols, from “The Christmas Song,” about chestnuts roasting on an open fire, to “Silver Bells,” were written by Jews. These songs de-emphasized the religious aspects of the holiday and turned it into a celebration of cold weather, family and simple pleasures. Even “Rudolf the Red-Nosed Reindeer” can be seen as a song about an outsider who, without losing what what makes him distinct, manages to join the in-crowd, just as Jews themselves did in America. In the end, the contemporary celebration of Hanukkah does not tend to hinge on the need to reclaim a distinctive religious practice. Instead, it centers on recapturing a sense of connection to other Jews. This Hanukkah, I will celebrate the holiday with my wife and children by lighting the menorah and chanting the Hebrew blessings – which I finally learned. The real highlight, however, will not be the religious aspects, which are pretty thin, but the gustatory pleasure of the thick, sizzling potato latkes, waiting to be covered with sour cream or apple sauce. This article is republished from The Conversation under a Creative Commons license. Read the original article here: http://theconversation.com/what-hanukkahs-portrayal-in-pop-culture-means-to-american-jews-107676.